Engineers at the Massachusetts Institute of Technology (MIT) believe they've just invented the first hydrogel-based contact lenses that will never dry. The engineers behind this fascinating new product say they've successfully created a special layer for hydrogel contacts that help naturally retain moisture. Not only will this material be useful in developing more comfortable contact lenses, but it could also be a big help in the field of bioelectronics. 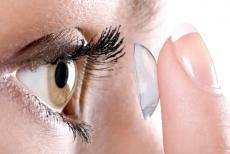 The hydrogels currently used on contact lenses tend to evaporate after even the slightest contact with wind. Many contact wearers are probably already aware how frustrating hydrogels are, especially after they get all crusty and dry. MIT engineering students solved this hydrogel dilemma by coating the front of the hydrogels with a layer of elastic polymers such as silicone and rubber. After testing these polymers extensively, the engineers discovered that the contacts retained more moisture and were far more resistant to the air. Xuanhe Zhao, an associate professor at MIT's Department of Mechanical Engineering , was the leader of this project. Dr. Zhao told reporters that his research team got the idea for placing elastomer on the contacts by observing the natural functions of human skin. Our skin actually works on multiple layers, much like the polymers being used on the contact lenses. On the top layer is the epidermis, which is in charge of protecting the lower dermis layer. The epidermis also blocks any external threats from puncturing the deeper layers of our skin. Believe it or not, the hydrogel-elastomer layer made by the engineers at MIT was actually found to have a stronger bond than the epidermis does to the dermis layer of our skin. Researchers ran numerous tests to determine how much energy it would take to break off their elastomer from the hydrogel. Amazingly, they found that it would take a force of over 1,000 Joules per square meter to break up the elastomer. 1,000 Joules is far higher than the force required for the epidermis to be removed from the dermis. In another test on these supercharged contacts, researchers placed the elastomer-laced lenses in a dry lab underneath a powerful UV light for 48 hours. When the researchers examined the moisture content of these lenses after the 48 hours, they found absolutely no change from two days before. The strength of these polymers is giving scientists hope for developing artificial skin for both robot and human use. Dr. Zhao believes this material can work to make lifelike skin on AI robots, and it could help doctors cure numerous skin diseases and burns. Another application of this material could be for what's called the "smart bandage." With the help of a few electronic sensors, doctors might be better able to keep an eye on a patient's blood pressure, oxygen levels, and other vital information. There are some who even believe these "smart bandages" placed on a person's skin could deliver microfluidic medication on command. MIT scientists are now adding enhancements to this powerful polymer product. For example, doctors are working on putting in mini channels to mimic blood vessels. Some engineers have added ionic circuits to act as artificial nerve networks. There's no word yet on when any of these projects will be released to the public, but Dr. Zhao is hopeful about the future of this innovation. Professors at MIT are busily working on perfecting their non-drying contact lenses, and they hope their work will encourage more scientists to use hydrogels as a basis for technological work.